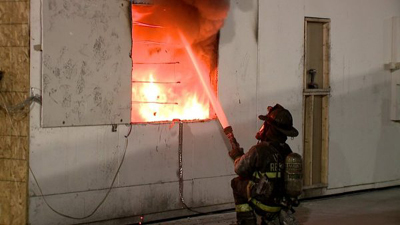 NORTHBROOK, Illinois — A groundbreaking study in Illinois could change the way firefighters attack the hottest and most dangerous fires. The Milwaukee Fire Department is taking part in the study, but a retired New York City battalion chief says the researchers are all wet. It may sound elementary, but scientists in suburban Chicago are studying whether applying water on a fire from the outside should come before search and rescue on the inside. "It's an inherently dangerous profession," says Erich Roden, battalion chief for the Milwaukee Fire Department. "Our ethos and our mission is to get inside that building as quickly as possible to rescue those trapped civilians."